I will be in Melbourne again for the CraftExpo next month, but because there will only be mini workshops at that show I have decided to fly down a little early so that I can run a couple of full-day freeform classes before the show. They will be held on Saturday October 2 and Sunday October 3. The class on the Saturday will be geared towards creating freeform fabrics for garments such as cardigans, jackets and coats (although the resulting fabrics would be equally suitable for purses, rugs and cushions, too). In the Sunday workshop we will cover soft and drapey fabrics, more suitable for shawls and wraps. Anyone who wished to take both of the classes would find that there isn’t an overlap, as we will be covering lots of different stitches and different techniques on each of the days, so bookings for the full weekend would be fine. will be encouraged to use at least some stitches and techniques pertaining to both, although you can choose to work mainly with just one craft or the other if you feel that you are more proficient in one particular area. The workshops will be held in Richmond and will run from 9:30am until 4:30pm each day. Email me at prudence@knotjustknitting.com) if you are interested (say which day, or both), and I will get back to you all the details. Places will be limited and bookings will be on a first come/first served basis. 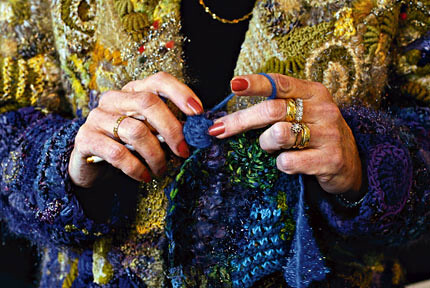 if you’re new to prudence and her freeform work, check it out at knotjustknitting. Filed under crochet, events, knitting. Thursday, September 23, 2010, at 3:34 pm. ‹ the beginnings of drape drape dressing.